I just adore subscription boxes. I always see the book ones around, but there are all sorts of other options. 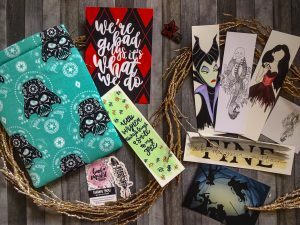 I found out about Bookmark My Heart from Etsy and I’m so glad I did because her new (January is the first month) subscription boxes are really fun and unique. Be aware though – each month there is only 10 boxes available! About: My name is Esha (pronounced Ace-a), I am a full time mom that has always found solace in my books. For as long as I can remember, I have always been a lover of reading and bookmarks. I have never been a collector of things, but bookmarks have been a constant in my life. 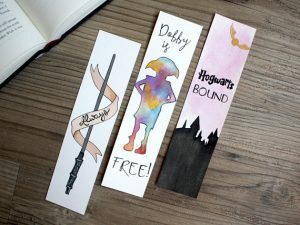 I have various kinds and it was not until I joined the bookstagram community and saw that others loved bookmarks as well that I decided to give Etsy a shot. I could not have foreseen the love that I have gotten thus far for my art. It makes me happy that my customers are happy with their purchases and it drives me to create more! 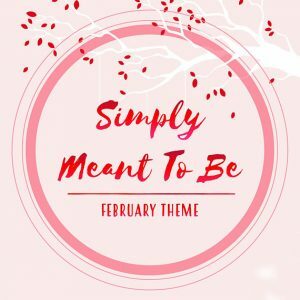 As a new small business I decided to create my monthly box as a way to highlight themes and give my customers a fun way of getting multiple pieces from my shop for half the price it would usually cost them. It is because of this that I have also decided to highlight other small businesses in my box. There are some great little shops out there that do not get much notice. Including them in my box is just a little way of expanding their reach. I of course will also feature some of my personal favorite shops at times. I can only hope that my customers enjoy opening up their packages as much as I have enjoyed putting them together. All of my hand painted pieces are made with care and are unique to each order. I am not a robot, so there are slight variations in each individual hand painted bookmark. I also offer a cheaper alternative for character bookmarks. Printed bookmarks are printed on 110lb cardstock (business card grade). This option is not available for quotes and non-character bookmarks as they are already priced at a low rate. Customization is offered for all hand painted products. Names may be added, colors can be changed, and full custom orders are also available for non-listed items. For customizations on listed products, customers are asked to view the details section for that listing. If an alteration is requested, I only ask that customers let me know what they wish for in the ‘note to seller’ at check out. For example: I have a #bookstagram bookmark listed. This can be changed to any color and/or any hashtag that the person so chooses. It does not have to be a hashtag either, it can simply be a name or a username. The only limit to the customization is my imagination. I must note that I have a few regulars already and I love working on custom orders with them and coming up with their vision. This is makes it all worth it for me. About Bookmark My Heart Boxes: Monthly boxes cost $23.00, excluding Exclusive boxes (i.e more on this to come, so keep an eye out! ), because of the extra items and packaging for that box, the price will be $25.50. Shipping within the US is $4 regularly and Shipping for Exclusive boxes are $6. International shipping depends on the country, Etsy provides an estimate. Boxes ship off in the 2nd or 3rd week of the month and there are 10 boxes available each month. Since there are such a limit on the boxes available, you definitely want to follow the shop and Esha to keep up to date on future boxes. 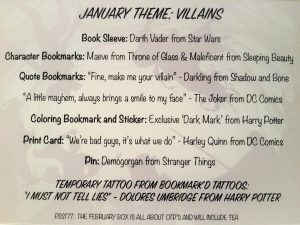 According to Etsy, the January and February boxes are sold out – but you can still buy the January sleeve. Just visit this link. 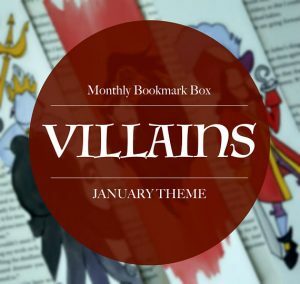 The January theme was Villains, which I love! Rachel Corson (follow her on Instagram) has allowed us to use her reveal photo for the January box, so thank you Rachel! 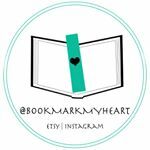 Finally, if you are interested in something from Bookmark My Heart, you can find a 10% off code on the Instagram page of all three of Esha’s reps! So tell me, what would you choose from the shop? A subscription box, or something more specific? I’d also like to clarify that this isn’t a monthly subscription in the sense that you are automatically signed up every month. Instead, everyone gets a fair shot each month to get a box (since there is a limited quantity). Therefore, you can buy one month only if you like the theme! Very cool, I love subscription boxes and this is a very unique one. I have never heard of book subscriptions, pretty neat idea. Love the bookmarks shown very cute. Wow this looks so cool! Such a lovely gift idea. Oh what a fun box. Thanks for sharing!! What a great idea for a subscription box! Thanks for sharing. I had no idea that even exist. Would make such a great gift!! This looks like such a fun and unique subscription box! I would definitely consider ordering one! Or even giving one as a gift! I’m so glad you shared this! That’s such a super cute subscription box!!! I love that it supports other etsians!!! Cute idea! I love bookmarks. This is so perfect for you, given how much you love books! I had no idea that some Etsy shops did subscription boxes… what a great way to supplement their income and to provide some original items for their customers! Love this! That’s such a cute idea. I actually saw her Guardians of the Galaxy bookmarks on IG and love them. I loved that she even made a cassette tape bookmark. It was so clever! What a fun cute idea for a subscription box! What a clever and fun idea. I need some of these for my kids. I know a few people who would probably be into these boxes! What a fun subscription box! I love this idea! How fun to get something from Etsy shops! I like the idea of subscription boxes, bu just can’t see myself spending that money every month. Thanks for bringing this to my attention though! You’re welcome! It’s actually just a month to month commitment, because of the limited quantity. So for this, you can buy just one box and that would be it. What a great box! I would love to have that Darth Vader book sleeve. That is awesome! This looks like a really special and unique box! Thanks for sharing! 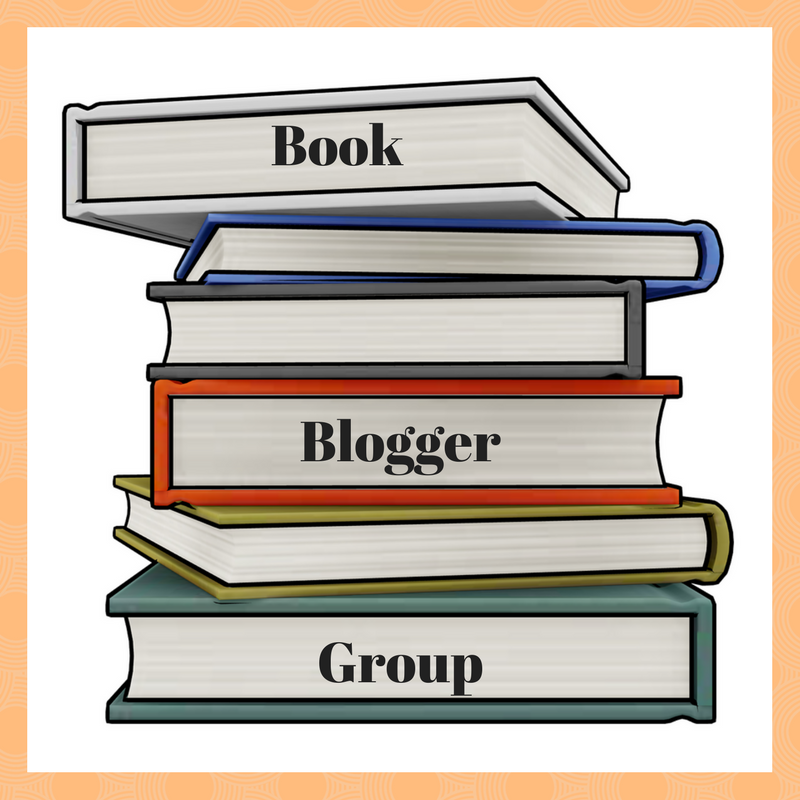 Nicole @ Feed Your Fiction Addiction recently posted: Which Types of Reviews Are Most Effective? Let’s Discuss! This is such a fun box! I sure do love reading. This sounds like such a wonderful, amazing idea!! I absolutely love it and I’m going to check out her shop now! What a creative idea, I love it! The bookmarks look awesome! I’ve always wanted to sign up for a subscription box, but it’s such a big commitment! I love the idea. If I had to choose something it would have been the January book sleeve–I think it was Darth Vader. This one is great because you buy it month to month, since there are limited quantities! And they might have just the sleeve still available if you want to check! I only subscribe to one box (The Bookworm Box from Colleen Hoover) but I’m always interested in learning about others. I’m not sure this is one I would subscribe to monthly but I definitely want to check out her etsy shop! Glad you shared this, Lauren! Okay what a seriously fun idea! That is super adorable – as a book lover, I think this is one of the better subscription boxes I’ve seen. I’d be excited to get one of these. What a fun, unique subscription box! The villains theme is so fun too. I haven’t tried very many subscription boxes, but there are so many out there now! Aww, this is such a cute subscription box idea! I used to collect bookmarks and I’m sure they’re all still hanging in my room back at my parents’ house somewhere (back when I had the time to read for fun :'(!! )–hoping to get back to that at some point + soon! 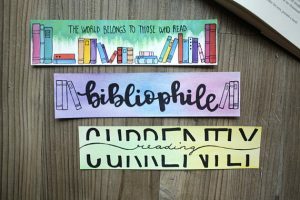 Ooo, bookmarks are a neat idea for blog promo, in addition to business cards. Is that a book beau in the villains box? I love those book sleeves. Great post! What a good idea! I always lose my bookmarks so I would have to keep them somewhere safe if I was getting a subscription of them. I like the villains idea. I love all the variety that is out there now with subscription boxes! And that people can share their creativity with them! Melissa's Midnight Musings recently posted: Review: Taste of Home Baking with Bake Sale Bonus: Fresh-Cooked Fun! 125 Bake-Sale Favorites! What a neat idea for her business and to help fellow business owners. And the January box was sooo cute! Thanks for sharing this awesome idea!! I’ve been wanting this for a few months and I miss it EVERY TIME. I have it in my calendar, I go by 9am and they are SOLD OUT EVERY TIME. AH! !